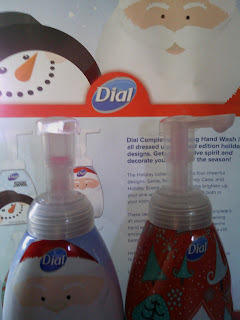 Dial Complete Foaming Hand Wash is all dressed up in limited edition holiday designs. Get in the festive spirit and decorate your home for the Season! I was lucky as part of the Purex Insiders to be choosen to review these wondeful holiday hands soaps! I received the Santa and the holiday scene pumps. These decorative bottle contain Dial Complete's #1 doctor recommended antibacterial foaming hand wash. This formula kills 99.99% of germs encountered in the household setting while still being gentle on the skin. Help keep your whole family healthy for the holidays with our patented Dial Complete Formula. My family and I love these! They are cheerful and keep your hands clean! you could win DIAL products or $50! Daily entry!! No cash for Christmas~ No Problem join LISTIA!! HEY TEXANS~ POWER 2 GO!